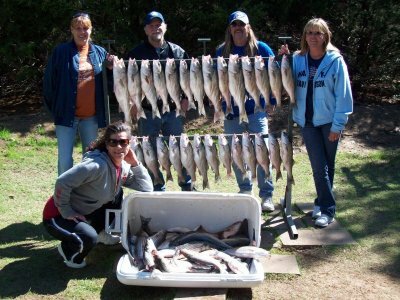 Three or four times a year The American Legion on Lake Texoma invites patients at the Bonham Veterans Administration Hospital out to the Post for a day of games and a Fish Fry. The American Legion is blessed to have a couple of Lake Texoma Striper Guides who are always willing to volunteer their time and effort to help catch fish to feed the vets and today was my lucky day to get to help the cause. Doug Keeter the Owner/Operator of StriperMaster Guide Service, invited me, my wife and a couple of our friends to go out yesterday morning to start the harvest for our upcoming visit. We left Highport Marina about 8am and headed north. The morning air is cool, well really kind of cold as Doug poured on the fuel and made the 350 chevy moter hum as it pushed the 23 foot Falcon across the rippling bright blue water.